All New Rectangular stamps were, like their predecessors, issued on ungummed papers. Present catalogues, following Masson, give these papers under five headings(1) White laid; (2) White wove; (3) Thin laid bâtonné; (4) Thin wove, and (5) Thin laid. Evans attempted (“Ph. J. India,” 1903, Vol. vii.) a very much fuller classification, with the provisos, correctly given, that it might prove too elaborate for practical purposes, and that the varieties which he included did not all denote specifically different periods. The list is nonetheless of importance, and we reproduce it, substantially, in its entirety. 1878-83 I Ordinary white laid, varying to very thick in the case of the 1-Anna. One of the only two papers ever perforated. 1878-83 III Thin smooth wove(a) Bluish; (b) Greyish to dull white. The second paper which was perforated. used for both the 1878-83 and 1883-94 issues. 1883? V Thin smooth greyish-wove. 1889? VI Quite white thin smooth wove. 1889? VII Thin creamy laid.
? VIII Thin rough yellow paper2-Annas only. To this admirable survey Evans added a few further remarks which may first be dealt with. 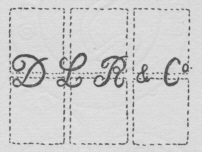 He correctly decided that Masson’s “ordinary laid” sheets of ¼-Anna brown, 4-Annas green and 4 + 8-Annas black were not issued stamps, and referred to them as Proofs. Though not strictly entitled to the term, we have placed them in this category for want of a better; and we have with, we think, better reason, included with them some impressions on native-paper which Evans considered merely “fancy” varieties. Evans, lastly, attributed a number of Plate-states to individual stamps, and we repeat these, with some additions and amendments, in our Check-list (Chapter XVIII) and elsewhere. Reverting to Evans’ summary, we now proceed to comment, very broadly, on his eight papers seriatim in order to give a general idea of the problems awaiting solution. It should be noted that his classification omitted the ‘thin laid bâtonné’ paper, though he mentioned it elsewhere. Paper I. The year 1883 is too late for any but abnormal use of laid paper, though examples are known. By far the most important addition which we have to make here will be that of the watermarks. These have been already touched upon in connection with the varieties used in 1877-78 for the oil-printed Circulars and rectangulars of Jammu. Paper II. Perforation was also applied to the wove paper in addition to the two given by Evans. Paper III. Evans’ statement is correct, but practically of little service. In extreme cases, only, is the tint of his “Bluish” paper sufficiently pronounced for certain identification, and it merges imperceptibly into the “greyish”possibly, to some extent, through having faded. Slightly greyish thin wove paper can, moreover, be found at later dates than 1883. The “bluish” thin wove paper was used in small quantities, from the very commencement of the New Rectangulars in May 1878, thus completely overlapping both the ordinary laid and wove. Paper IV. This coarse yellowish thin wove is correctly described and dated, though its employment virtually ceased in 1889. Both this and the preceding paper were in intermittent use, overlapping both of the first two papers, almost from the commencement of the New Rectangularsa fact that Evans alone really appreciated, though even he was unaware of the extent to which it occurred. Paper V. Some, and, indeed, most, of Evans’ second “greyish” thin wove is quite inseparable from any of the third paper above, nor does he describe any distinction, or even vary its descriptive title. He probably had this variety in mind when suggesting that some of his classification might be over-elaborate. Paper VI. The pure white variety of thin wove is, again, correctly dated by Evans. It comprises two fairly distinct qualitiesmeshed and unmeshedand these differences in texture are occasionally helpful. Unused specimens, particularly if in sheets, can usually be correctly classified at a glance, but, in the case of travel-stained used examples, it is often impossible to decide merely by the “whiteness” of the paper. ...creamy in tone, but a rare variety exists which was coarser and more distinctly yellow. Paper VIII. This is considered with the following. Catalogues, following Evans (who included the special papers, introduced in 1883 for the 2-Annas only, with his fifth, thin wove variety) have been responsible for some confusion. In all black issues and in all coloured ones from 1878 to 1882 inclusive, the 2-Annas was printed on the normal papers. When, in 1883, red was retained for two denominationsthe ½-Anna and 2-Annasit became necessary to make some distinction between them, and it was decided to print the latter on coloured paper. The colours were shades of green (thin) and yellow (thin, as well as a thicker rough), and such papers necessarily need separate classification. Their inclusion, for many years, with the normal thin papers, has probably been responsible for the belief in a 2-Annas on a yellow thin laid papera stamp which never existed. The special 2-Annas paper was, at first, a very thin smooth “tissue,” or pelure paper quite unlike any “thin wove,” even apart from its distinctive colouring. A late variety (Evans’ No. 8) may have been, as Evans suggested, some of the normal “coarse thin wove,” but as this paper was dyed a brilliant yellow for use with the 2-Annas, it needs separate clasification, equally with the pelure papers. 1. 1878-80. White laid varying greatly in thickness, and occasionally perforated. 2. 1879-80. White wove ditto. 3. 1880 (1879?) Thin laid bâtonné. 4. 1878-1889 Toned thin wove in fine, coarse and intermediate textures. Perforation applied, though rarely, to a fine variety. 5. 1887-92 Thin creamy horizontally-laid. 6. 1889-94 Fine thin wovepure white. 1. 1883-1894. Pelure paper dyed yellow (shades) and green (shades). 2. 1892-94. Yellow and orange-yellow thin coarse wove. From the above, it will be seen that, except for some amendments as to dates, and the introduction of the “Pure white thin wove,” our considered list is but slightly different from those of the catalogues of to-day. But though we have convinced ourselves that the excessive overlapping of papers and, more particularly, of the “toned thin woves” with their intermediate forms would, if further elaborated, merely prove a “will-o’-the-wisp” of classification, yet collectors should certainly make some separation between the “fine toned” and the coarse toned” varieties. Further research may still enable a line to be drawn, and this line would then have to be applied in further study of the Reprints, which were printed on these very papers, as they were, also, on the “pure white” and, (though in very rare instances), on at least one variety of thin laid. The widely different appearance of impressions on fine and coarse papers is often such as to lead to the mistaken conclusion that they represent widely different periods. We now take the papers in order. Laid paper, of one variety or another, was employed regularly for about the first two years of the New Rectangulars, following about a year of experimental use with the oil-printed stamps of Jammu. It shewed variations from thin to extremely thick. Masson asserted that the difficulty experienced in making the thicker qualities (and more particularly those of the following wove paper) adhere to their envelopes was, ultimately, the cause of their discontinuance in favour of the thin wove. ...quently, no useful purpose is served by dividing the stamps into horizontally-laid and vertically-laid groups. The horizontally-laid variety is usually slightly the more common: With “thin laid” this is the only variety found. Nearly all the New Rectangular stamps seem to have been printed on sheets of foolscap size, each capable of taking four plate-impressions. This method was certainly practised with some papers, but, in the case of the laid and wove papers, the margins round the majority of known sheets prove that not more than two of such impressions were made. On the wove paper which follows, traces of a watermark have been found, but examples are so rare that it may be said that, for all practical purposes, the laid paper of 1877-80 is the only watermarked paper of Jammu-Kashmir. No paper was ever watermarked so as to provide each stamp with the same watermark. Such watermarks as have been found, whether with the Jammu stamps or the New Rectangulars, are all such as may be described by the term “sheet-watermarks.” Some of these took the form of large designs of an armorial nature of which, since they occupied a considerable part of the sheet, small portions fell on some stamps only. Others again appear in the form of capital letters (usually double-lined) which, if they could be reconstructed, would doubtless shew the name of the firm which manufactured the paper. Some further remarks will be found in another Chapter on similar, but not identical laid paper used for Kashmir postcards of 1883. We now refer to our illustrations shewing tracings of four of the sheet-watermarks used for the New Rectangulars. Of these four, the first two are of armorial type: both have been found used for the Jammu oil-printed stamps of 1877-78, and both have also been found used for stamps of Afghanistan. Masson stated (Part I., p. 41) that some of the laid paper of the latter country appeared to be “very similar” to that of Kashmir, and his theory now receives confirmation. ...traced it to ½-Anna stamps, both in slate-purple and red of the New Rectangulars. In both of the two latter instances the sheets are imperforate. ...or that the 1872-73 issue was reprinted. In the latter event, Bacon’s list of Afghan reprints, which gives the issue of 1881 as the earliest for which reprinting is known, would require amendment. 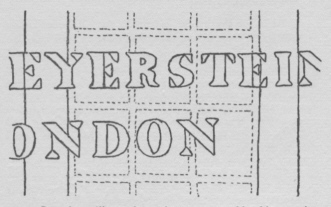 The second armorial type shewn in our illustration (which is greatly reduced in size) occurs, like the preceding, on paper used for the oil-stamps of Jammu for the imperforate ½-Anna slate-purple (and probably others) of the New Rectangulars, and also for the same 1872-73 issue of Afghanistan. 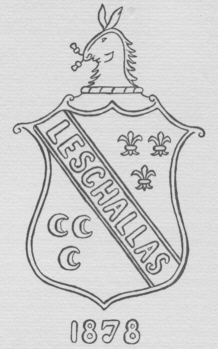 Apart from the difference of watermark, the actual paper appears to be practically identical with that of the “Leschallas.” We have been unable to trace exactly all the details of this watermark, including those of some motto contained in the scroll at the bottom of the design and, to this extent, our illustration is incomplete. A third “armorial” type is also known on laid paper, imperforate, of the ½-Anna red New Rectangular. Only a portion (unsuitable for illustration) has, as yet, been found. This is smaller than the preceding and is composed of two concentric ovals, of which the inner one appears to shew a knotted-ribbon device. We have found, on notepaper, what appears to be the upper part of this watermark, shewing the ovals surmounted by the head and shoulders of a lion holding a flag. ...firm without the addition of any armorial or other design. One of these, the subject of our illustration, shews the lettering in single-lined script, and occurs (again on imperforate paper) with the ½-Anna slate. The existence of a second seems to depend on a part-sheet of the 1-Anna red, also imperforate, which is in the Beckton Collection, and which shews a large double-lined capital “W.” Neither of these has yet been found with stamps of Afghanistan or with the Jammu laid paper of 1877-78; but a similar paper is known, in conjunction with a variety of the ½-Anna oil-green Circulars which was, almost certainly, never issued and which may possibly have been used for a true Reprint taken after the Jammu oil-stamps had become obsolete. Our last illustration shews a considerable portion of the third of these “letter” watermarks as it appears over the bottom row of impressions in an imperforate sheet of the ½-Anna red in the Earl collection. ...pronounced than with the laid paper. One of the very thickest varieties was in use before 1879. All of the three denominations are known on the very thick qualities, but we have only found examples of normal thickness perforated. At times, the thickness amounts to that of thin card. The texture of the paper is fine and, in this respect, shews little variation. A fairly thick but exceedingly coarse paper is known, but this is an abnormally thick quality of the coarse thin wove paper. We have seen four single stamps only, shewing any trace of a watermark and have, therefore, no means of judging its nature. It is certain that practically the whole of the wove paper was unwatermarked. As in the case of the laid paper, the full foolscap sheet of wove never received more than two plate-impressions. This paper was only employed for a single New Rectangular stampthe ¼-Anna printed in blue watercolour. We are unable to separate this from the laid bâtonné used in Jammu, in 1877-78, and have previously described the latter in Chapter VII. The exact time of its issue (? re-issue), for the New Rectangular series is still uncertain. The earliest known date is 4th March, 1880, and it was used exclusively in the Kashmir Province. At this date, the thin wove papers, next to be discussed, had been in existence for nearly two years, but, in order to avoid disturbing the continuity of these, we are taking the bâtonné slightly our of its true chronological order. Nothing is known as to the size of the sheets of this paper, nor as to the number of plate-impressions applied to it. Thin wove paper was first used, early in May, 1878, in the Jammu Province. Owing, as already pointed out, to the impossibility of a chronological classification of even the principal varieties of this paper, little remains to be added, save to emphasize a few points. The two toned papers, “fine” and “coarse”, with their many minor varieties, not only overlapped the laid, wove, and laid bâtonné, but are found continually disappearing and re-appearing, or, in other words, overlapping each other. The most that even a moderate specialist can attempt is, therefore, to sub-divide the toned papers of 1879-89 into “fine” and “coarse” and to retain the “pure white” (and always fine) paper of 1889-1904 in a separate class. Even during the later period some small amount of the older toned varieties were still, though rarely, being issued. Evans, to some extent, and Masson very slightly, were aware that some overlapping had occurred, but nothing would be gained by further allusion to what has been written by either. Masson was, however, almost certainly correct in stating that the toned papers had been kept from very general use until the laid and wove papers had been used up towards the close of 1880. We find that the coarse toned papers were very rarely used in Jammu after 1888, and that most of what was used in 1889 came from the British Post Office at Leh. Owing to the many minor varieties, reproductions could give only a misleading impression. The peculiar aspect of many stamps, particularly the ½-Anna, is very striking, and has, not infrequently, given rise to the belief that these were forgeries. The blurring of impression can often be found on the fine papers also, the cause here arising from the dirty condition of the plate. The ½-Anna plate was throughly cleaned on more than one occasion, and blurred printings on the fine paper were at their worst at a comparatively early period, these being mainly from the ¼-Anna and ½-Anna plates. The earliest known date for this is 3rd September, 1887, when it was certainly used in Jammu. It was freely employed in both Provinces during 1888, and the catalogue-record of 1889 must now be put back two years. It has not been seen used in the Kashmir Province until 1888, a year later than the Jammu record. A most remarkable feature of this paper is that no example whatever is yet known of an impression on paper having the laid lines vertical. Out of many hundreds of stamps of all values examined by us, all, without exception, have been on horizontally laid paper. The probable explanation is that the paper was cut to the shape and size of the plates from a larger sheet which could only be economically divided in one way. By far the greatest use of this paper was made prior to 1892, after which the employment of the “pure white” thin wove was almost exclusive. It was, however, used in December, 1894a month after the native stamps had been withdrawn. The catalogued 4-Annas green on this paper appears to be an erroneous record, and will be dealt with later in this chapter. The size of the sheets of this paper may have been foolscap, but is not known with any certainty. A point which favours the theory of a sheet of some smaller size is that we have no record of a complete plate-impression, in black, shewing, on the margin, any indication of a simultaneous printing from some other plate, though this practice was very general during the lifetime of the paper. With very few exceptions, the “pure white” paper, though definitely latest in period, shews the clearest of all the impressions. This is largely due to the texture of the paper being invariably exceedingly fine and smoothly surfaced. Sheets of these papers were normally of foolscap size. They are known with, and probably normally received, four complete impressions of the plate. 6. Papers of the 2-Annas. On the introduction of the new colours, in 1883, the 2-Annas continued to be printed in red, but (in order to distinguish it easily from the ½-Anna, for which red was also retained), on the special coloured papers noted above. Yellow-green (1883-91); Bright green (1888-89); Pure yellow (Dec. 1889). This shews a considerable amount of overlapping, as with the normal papers of this period, and this overlapping was even greater than Masson believed, for he gave a period of ten months only for the green paper, whereas it was used, in small quantities, for some five years. Of the pelure papers, the green is quite distinctive. The pure yellow is also distinct though nearly approached by a very slightly greenish yellow of the first group. The printing on the true yellow is, however, always in orange-reda shade never employed with any other pelure paper. A large number of shades of the “yellow-green” occur, varying from that already noted as approaching yellow, to one which, though really quite distinct, can be mistaken for the true green. The dates given in our list of these papers shew the periods of general employment, but many instances occur of the use of stamps beyond the normal period. The pelure papers shew, though very rarely, narrow lines running through the texture. The Hancock and other collections classified such varieties as being on the “thin yellow laid” of the catalogues; but these narrow lines are merely accidental in the manufacture, and the paper shewing them is not, in any sense, a true laid. If the coarse variety following had, as suggested, been produced by dyeing normal thin wove paper yellow, the thin laid might have also been dyed, but, at present, all the available evidence points strongly against any such occurrence. The size of the full pelure sheet is not known but, in view of its extreme thinness, we should doubt it having been capable of receiving more than a single plate impression. (b) Coarse thin yellow wove. Apart from its colour, this paper is practically identical with the normal coarse thin wove, and the suggestion made by Evans that it may have been the latter paper dyed locally is, we think, correct. There were two distinct printings on this paper in dull red (1891) and in red (1892) respectively. A sheet in the “dull red” was noted in the Hancock Collection as a Government Reprint, but the theory of this well-known philatelist is quite untenable in view of the many examples known of these stamps used on various dates during 1891three years before reprinting could have commenced. Full sheets of this paper were probably of foolscap size capable of receiving four plate-impressions. This must, almost certainly, have been the case if, as suggested by Evans, they had been produced by dyeing the normal uncoloured paper. We conclude our notes on the New Rectangular papers with a brief reference to the so-called controls consisting of the embossing, in plain relief, of certain designs, on some varieties of the thin wove paper and on the thin laid. The ordinary laid, wove, bâtonné and coloured papers have never been found with a Control of any description. Type 2. The small elephant. Type 3. The large elephant. Type 4. The horse control. Type 1. 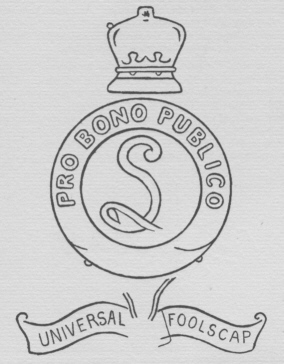 A small transverse oval containing some yeardoubtless that of the manufacture of the papersurrounded by a scroll-work design. Type 3. A similar design surrounded by a large oval with an extreme width of 22 m.m. Type 1.This is the earliest of the Controls, the first year shewn being 1877 on thin wove. The following years have also been found on the thin wove papers1878, 1879, 1881, 1882, 1883, 1884, and 1891. The 1891 Control has only been found on the “pure white” variety. With thin laid paper it has been found only with the years 1884 and 1888, in the latter case on the rare coarse variety. The last named paper (with identical control) was also used for some of the Official Forgeries of the Circulars. The periods of the “Elephant” controls are necessarily more difficult to assign, since, being undated, dates are only discoverable from used copies of the stamps: and as not more than one stamp out of two or three hundred would shew any control, material is wanting from which information might be obtained. ...staining properties of the yellow pigment. Such stamps had definitely ceased to be issued in 1889 at the latest. Type 3.The “Large Elephant” would seem to have appeared later, since it has only been found on the “pure white” variety of 1889. At present it is only known on the ¼-Anna and 8-Annas Official black stamps. 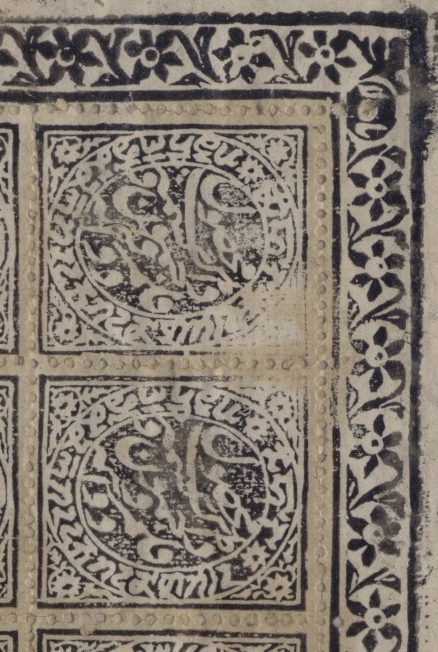 If we assume, as we believe, that all black printings were taken from the entire Composite plate, we must also include the 4-Annas black with those mentioned above. The fourth, and exceedingly rare control, is known to us by a single example, which is, unfortunately, too indistinct for reproduction. It is that of a “Prancing Horse” without framing of any sort, and occurred on a ½-Anna red stamp on thin wove paper. This stamp was from the first state of the Plate, and the period would therefore be 1878 or 1879. For all practical purposes it may be said that perforation was only once attempted by the Native Officials. There is evidence that a late attempt was made to continue a process which entirely broke down soon after it had commenced, but this was on so small a scale as to have but little bearing on the subject. Prior to the issue of the New Rectangulars, two perforating machines, which may be called the “A” and “B” machines respectively, were provided and quickly abandoned owing to inefficiency. As described by Masson, they would seem to have consisted of small brass beds with hinged lids, containing sufficient blunt-ended needles for the performation of a single plate-impression. ...the addition of four central blanks, so as to be correct for perforation by this particular machine. No attempt was ever made to perforate the ¼-Anna stamps or those from the Composite Plate. This was applied to the ½-Anna only. The perforation, which is most irregular, both in line and spacing, gauges from 10 to 12. Evans gave the gauge at 10-13, but although 13 is occasionally touched for a few holes, 10-12 would be the more generally correct. A perforated proof-sheet from the Masson Collection shews the machine to have applied a “harrow perforation” to the entire sheet at a single operation, there being no duplication of the holes at the points of intersection of the lines, such as would have occurred if vertical and horizontal perforation had been applied separately. This machine was found in a dilapidated condition when the Native Posts were discontinued in 1894, and was stored at the Office of the British Accountant General at Srinagar. In the case of the Proof-sheet and stamps on similar thin paper, small circles of the paper were, more or less, removed by the punching of the “needles.” But with the thicker laid paper, which formed the great bulk of what was perforated for issue, very few of these circles were actually removed; the edges of single stamps then appear as if pin-perforated, and stamps have been recorded in error by past writers as perforated by this distinctive method. This was also of the “harrow” variety. No sheet of perforated stamps is known, but Masson’s collection contained proof-sheets both of the 1-Anna and 2-Annas perforated by this machine. These shew the perforation to have a gauge of 13-16 (or, as Evans, following Masson, described it, about 20 to the inch), with the same irregularities in line and spacing which characterise the “A” perforation. The Use of the Machines. The “A” machine was more or less commonly used for the ½-Anna stamps printed in red and in slate on laid paper, and here a digression must be made. On the introduction of the New Rectangulars it would seem certain that it had been decided to retain red as a standard colour for Jammu, and probable, also, that blue had been determined on for Kashmir. Masson, who first came to this conclusion from a study of the obliterations, held that this applied to all denominations. Evans, while admitting the theory as far as the ½-Anna was concerned, contested it as it affected any other denomination, and his view was, as we shall show later, the correct one. To return to our perforation, it is to be noted that both the red and slate stamps were first issued perforated. Jammu issued its red stamps considerably earlier than did Srinagar its slate ones. These stamps were mostly on laid paper. The result was that the perforated red stamps on laid were used for about a year in Jammu, and are common enough; but Srinagar only received its first supply shortly before perforation was abandoned, and hence the scarcity of the perforated ½-Anna slate. Evans mentioned that the only “B” perforation, which he had seen, was on an unused 1-Anna stamp, and that the perforation was 11½. No such perforation could, however, have possibly been produced by the “B” machine, and we are the more at a loss to follow Evans here, since he suggested that it might by an “A” perforation, although the “A” machine was too small to take a 1-Anna sheet. Masson held the opinion that the “A” machine, though quickly abandoned in the first instance, received a further trial at a later period, basing his view on the existence of a ½-Anna perforated red stamp bearing a Jammu obliteration of a considerably later type than that of any in use during the first perforating period (1878-79). This example was not found among his stamps, but we have discovered a proof of Masson’s theory in a stamp contained in the Beckton Collection. This is an “A” perforated ½-Anna on thin fine wove, printed in orange, and the earliest printings in this colour occurred as late as 1881! This specimen, which is unquestionably genuine in every respect, bears an obliteration of a Native Post Office in the Kashmir Province. This type of obliterator could not possibly have been in existence in 1878, or even in 1879; and the combination of colour and obliteration definitely establishes the correctness of Masson’s theory. The very belated attempt to renew perforation must have been almost immediately abandoned, and the Beckton specimen, together with one other example in the Tapling Collection in the British Museum, remain, so far as we are aware, the only ones now in existence to prove that such an attempt was made. 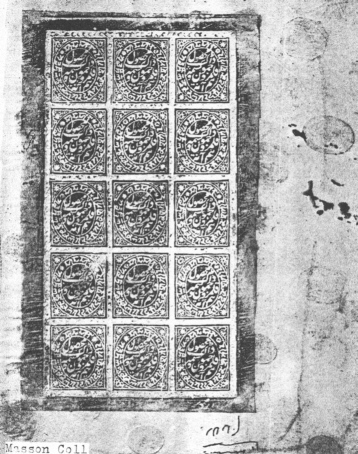 We must here anticipate a later chapter in which we shall shew that the earliest New Rectangular stamps were not, as hitherto recorded, sent to Jammu at all; but that the plates and perforating machines were sent in the first instance, and only returned to Srinagar towards the end of 1880 or early in 1881. This being the case, we have, at once, an explanation of this later attempt to resume perforation since, in 1881, Srinagar had only just come into possession of a perforating machine, and would, naturally enough, attempt to make use of it. At the closing of the Native Posts in 1894, this “A” machine, only, was found to exist at Srinagar; and as no Srinagar-printed stamp is known with the “B” perforation, it may well have occurred that it had broken down so completely at Jammu that it was never to returned to Srinagar at all. ► Chapter VIII concluded: The Issued Stamps.